I’ve been studying knee biomechanics for an epic upcoming series of posts on knees and yoga. I’ve had over 25 years of knee pain and will be blogging about my dumb knees, what finally nearly fixed them, what set me back from this fix, and how to apply yoga and Restorative Exercise™. Thomas Michaud, who wrote THE book on human locomotion – Human Locomotion: The Conservative Management of Gait Related Disorders, provides in another of his books, Injury-Free Running: How to Build Strength, Improve Form, and Treat/Prevent Injuries, an eye opening test for lateral hip strength, which is the domain of the abductors – gluteals and tensor fascia lata. The test is called the Forward Step-down Test. I photographed and videotaped (see my FB page) myself doing this test. In the images, I used an 8″ stool instead of a 4″ box to step down from, because that is what I had at the moment and I am impatient. 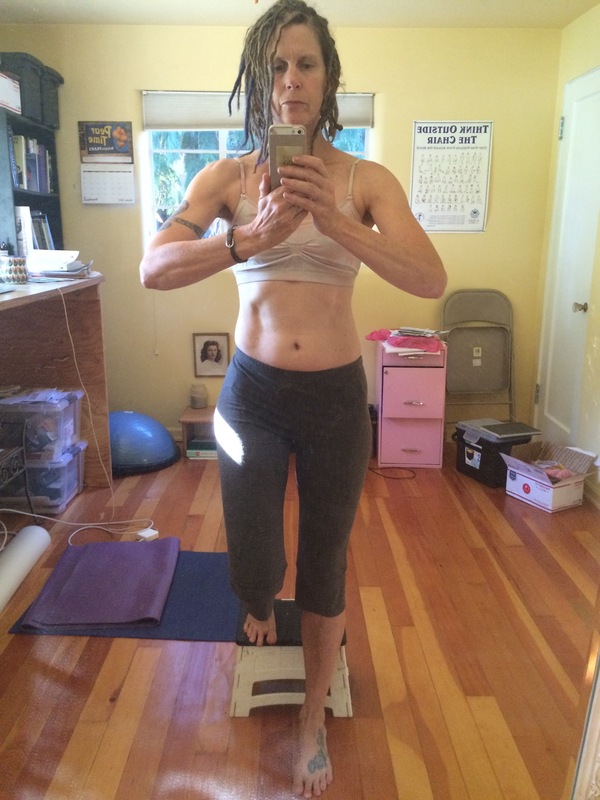 **Later, I stacked yoga blocks on a book to make a 4″ box, which is the customary height for the test. The results were about the same, albeit less dramatic on the 4″ box. Otherwise, I tried to replicate his assessment. Ideally, when I step off the box, my non-stepping hip should not displace laterally (to the side). The more it displaces, the weaker are my abductors. My abductors should be firing (eccentrically contracting) to stabilize my hip joint, keeping movement in the sagittal plane since I am moving sagittally or forward. Notice the difference in displacement of my right hip (second image) as compared to my left. What is interesting is that I can and do make a point of firing my lateral hip muscles in yoga, especially in single leg balancing postures, and I regularly do the “pelvic list,” an exercise I learned from my teacher Katy Bowman (warning if you don’t like toddlers, don’t watch this video). All of this work balancing while intentionally firing my lateral hip muscles in yoga and active mobility training via the pelvic list has made me strong and good at balancing in yoga and pelvic listing. But, it has not translated into coordinated, timely recruitment of my lateral hip muscles during this particular movement – stepping down. Who cares? Well, besides my hips, my knees care. Not only do my hips take a beating each time I go down stairs or downhill, hip weakness is the most likely cause for patellofemoral pain syndrome. It turns out that this pain may not be due to an unstable patella that is not tracking correctly, thus moving sideways, as has been thought for years by sports scientists and clinicians, but it is likely due to the outer aspect of the femur moving into a stable patella because of weak abductors. Whoa! I want to protect my hip and knee joints by functionally improving my lateral hip strength. I’ll continue conditioning these muscles through active yogasana balancing and pelvic listing, but I’ll also be devising a plan to train my hips for the hugely important and frequently occuring movement pattern for which they are currently offline – stepping down. By varying frequency, rate, direction, location, and any other force characteristics of stepping down that I can manipulate, I will train my hips not just for stepping down from a 4″ box but for stepping down in a multitude of situations. Like life. I’m going for variation in my stepping down – from varying heights, from unstable objects, from varying surfaces, by controlling different joint angles, etc. If you get in my way, I will step down from you. Or maybe onto you.